The blog will take a short break, for holidays and such, and will be back in mid-July. 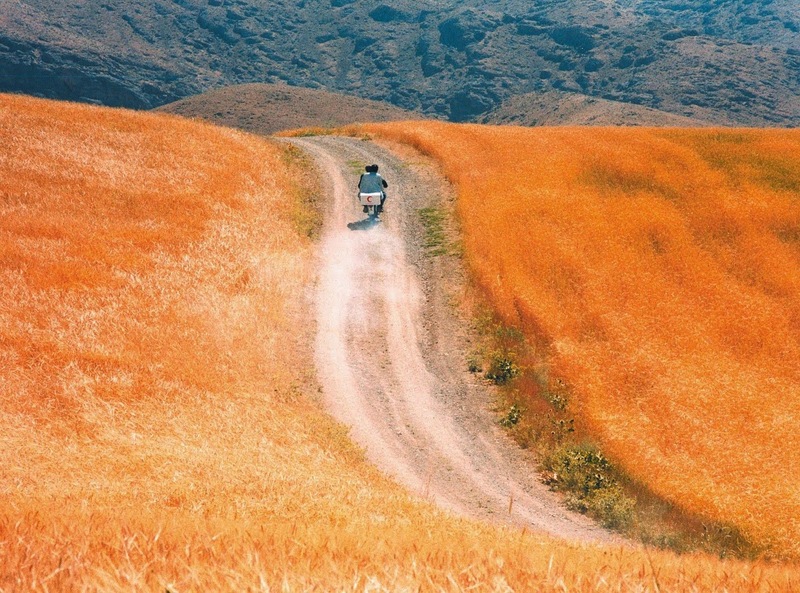 Until then, enjoy these images from some films of Abbas Kiarostami, one of contemporary cinema's greatest visual poets. 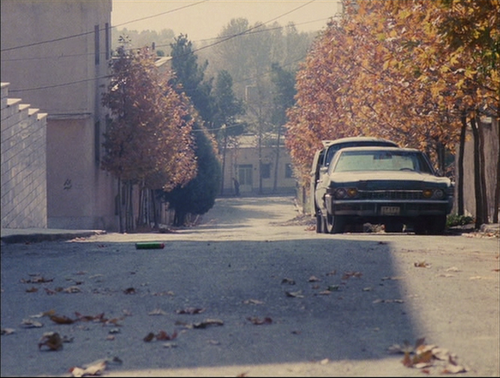 This scene is several minutes long, with the camera just looking at an empty can rolling down the road. That is a special kind of beauty. After I had been out walking for maybe two hours I came to a road and there was a bus standing. "Get in, I'll take you back to Kalgoorlie." the driver said. "No, I want to walk." I replied but he would have none of that. "No, I'm not leaving you out here, it's too dangerous." So I got on the bus and sat down. There was no charge. A good thing that driver was not around when I went for a much longer walk in Western Australia, north of Perth, just me, my hat and my water bottles, because I was out for almost the entire day (with a rest stop at a farmhouse) and that was probably even more dangerous. But that is one thing I like about it, the extremeness of it, the air so hot you can almost feel its texture. I have also been for long walks in the centre of Australia, past both Uluru (aka Ayers Rock) and Kata Tjuta (aka Mount Olga), sleeping on the ground and under the sky, sometimes awakened by humungous insects crawling down my back, and at one point walking barefoot through the desert after an unexpected rainfall. 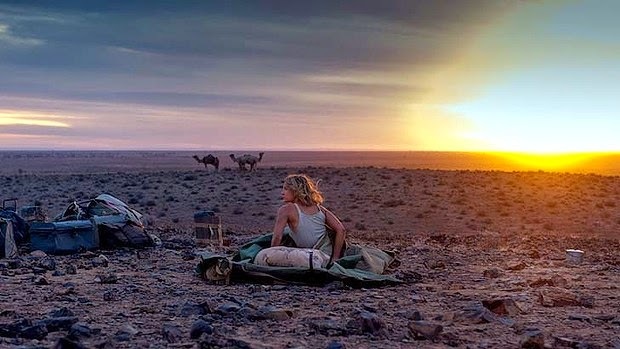 But none of my experiences, amazing as they were, can compare to Robyn Davidson's walk through the desert from Alice Springs due west to the Indian Ocean. It took nine months and she did most of it in the company of only her dog Diggity and four camels, and for one section of her trip she was guided by Mr. Eddie. Her walk took place in 1977 and it has since been told in various ways, including by herself in an article in National Geographic and then in a book. Now there is also a film, directed by John Curran and with Mia Wasikowska in the lead. A film I like a lot. Wasikowska is very good in her part and the film captures the Australian landscape and the desert beautifully; the cinematographer is Mandy Walker. The soundtrack could have been more imaginative, now it is mostly just an average score, and the brief flashbacks to Davidson's childhood were unnecessary I felt, but other than that I have no complaints. I like that they have not tried to make her out to be a saint, or hero or something, but a relatively normal person with sometimes poor people skills. In interviews made now Davidson has expressed her surprise and even hostility towards people asking her why she did it. "That's only because I'm a woman. Nobody would ask a man that." she claims, which is the kind of reply that might sound enlightened and true but is neither. As her endeavour is rather extreme it is a perfectly reasonable question, and many men doing such things have been asked why. Of course they have. Men who climb high mountains for example, and they usually have a default answer. "Because it's there." Davidson might have had her own personal reasons for going, reasons she wants to keep for herself, or she might not necessarily know why she did it, but it does not matter. Deserts are known to have a strange appeal to certain people. T.E. Lawrence is one of the most famous examples. Wilfred Thesiger is another. There are also many unfamous examples, such as myself. Maybe Davidson is one of us, or someone who could answer the question "Why?" with "Because it's there." I have been told that whoever has seen water on three occasions in Todd River, which runs through Alice Springs, is a local and by that definition I am a local, although I would not like to live there. (Melbourne though is a different thing...) But the desert and the camels have lost none of their appeal. If you have once scratched a camel behind its ear while it rested its nose in your armpit you would probably agree. Until the next time I will be able to do that, rewatching Tracks will be a second best thing. It is definitely a film for me. And it reminded me that Mia Wasikowska should do a film with Jane Campion. In an earlier post about racism in American cinema I mentioned the director George Sherman a few times. As he is somebody most would be unfamiliar with I thought I should write something about him. A year ago I did not know anything about him but when I came across his name I got curious and watched a number of his films, about 20, and as they are very good the quality of his films is not the reason why he is unknown. He has just fallen through the cracks, and finding information about him is very difficult. Even images suitable to illustrate this post were sparse. But he deserves to become known and retrospectives are warranted. It is fair to say that George Sherman, after an inauspicious beginning in the 1930s, should be regarded as one of the best directors in the post-war period, especially in the 1950s, even though he is completely unknown. The films are politically interesting, but it is the visuals (and sometimes the audials) that make them so exceptional. 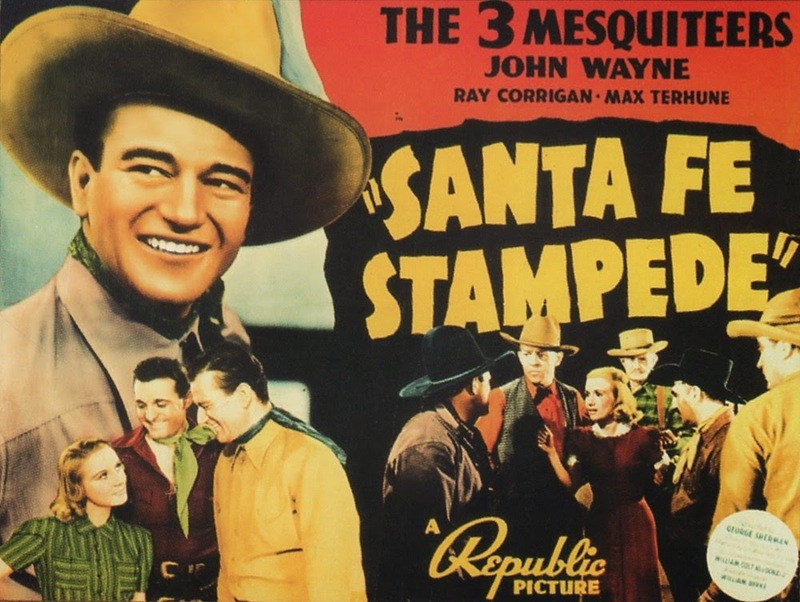 Some of them have images and scenes as good as those from any other filmmaker, whether it is a night raid at a British camp, to the sound of Christmas carols, in Sword in the Desert (1948) or epic battle formations in the end of Comanche (1956) that can be compared to Kurosawa's Ran (1985), or a crowded street suddenly emptied in a second, leaving only a man left behind who was about to be lynched by a mob, in Reprisal! (1955). Sherman had an eye for dramatic and dynamic compositions second to none, and he knew how to use sound, silences and music to remarkable effect, and such scenes can be found in almost all of the films I have seen, at least from the 1940s and onwards. In Comanche there is a scene when two scouts come across a slaughtered cavalry regiment, lying in the grass, barely visible. The two men walk among the dead, with the only sound heard that of the wind blowing across the grass, in a sequence that can only be described as haunting. The sky often has a prominent place in Sherman's films, scenes often begin with a shot of it and then a pan down towards the ground and often shots of the sky serve as transitions between sequences. Sometimes it takes on thematic meanings as well, with characters seeing visions in the sky. And there are always shots from a very low camera angle, looking upwards, so that the humans almost become invisible under an impossibly large sky and in an endless landscape. It is typical of Sherman that in War Arrow (1953) there is a fort that has no walls, he is a filmmaker who portrays space as infinite (and as such is the opposite of Henry Hathaway, who likes restrictions and frames). In the 1940s Sherman moved on to hour-long B-movies, in the original meaning of the term. In 1942 he made X Marks the Spot, which is a quite good urban thriller and a change of setting from the earlier (sort of) westerns. He worked mainly for the studio Republic in the 1940s and in 1945 he made his first conventional full-length feature, The Lady and the Monster, aka The Lady and the Doctor, with Erich von Stroheim in the lead. They worked again in Storm Over Lisbon (1944). Now Sherman got better, and got bigger budgets. In 1946 he got a contract with Columbia Pictures and stayed there for two years until he moved to Universal. There he was until 1955, after which he moved around between studios, more of a freelance director, and in the 1960s he made several films in Europe. Sherman's last film was Big Jake (1971), although he later directed a few episodes for a couple of TV-series. He died in 1991. Maureen O'Hara in Big Jake. It is difficult to know exactly how much input Sherman gave and how much control he had, the only thing to go on are the films. But since they all share so many things yet have different producers, writers and cinematographers it is reasonable to assume that he had both visual and thematic ideas that he often managed to get across. Sherman's films are usually hard-edged, sometimes surprisingly bleak and bitter. In Sword in the Desert the embittered captain (played by Dana Andrews), who has transported Jewish Holocaust survivors to what is to become Israel, is asked "You don't have much faith in mankind, do you?" He answers "Why should I, what has it ever done for me? Or them?" as he points to some of the survivors. That is a line that could be spoken in a number of Sherman's films, and often with American Indians in the place of Jewish refugees. There is a startling awareness of the suffering the Indians have had to endure, and how it was the white man who started everything. In the beginning of Chief Crazy Horse (aka Valley of Fury 1955) there is a shot of a settler's house, and the voiceover says. “You can’t tell anymore but this used to be the Lakota Sioux country” and then a dissolve changes the image from that of the homestead to that of an Indian village with tipis. It is a great visual symbol of how they were wiped out and what came instead. In Comanche there is a scene where the background story of terrible massacres committed by the Spanish against the Comanche is told, and the chief of the Comanche points out that “White man sent the first soldier, we the second.” In The Battle of Apache Pass, the chief Cochise points out that the fight against his people began with the Conquistadors. In Tomahawk the white people's consistent betrayal of the Sioux is repeated throughout. But another message in the films is that a reason why the Indians were defeated was that they did not act together, but were split up, often fighting each other. There is also mentioning of how the diseases of the white people kill the Indians. A different take is in Reprisal!, which is about a man who is half white, half Indian, and although he wants to blend in among whites he is not welcome there. The one thing that mars these films' progressiveness is that the Indian characters are often, but not always, played by non-Indian actors, as was the norm in those days. But the films are on the side of the Indians, and some of them are told exclusively from their point of view. There is a rebelliousness to be found in the films too. Comanche Territory (1950) ends with a white woman (played by Maureen O'Hara) stealing guns and giving them to the Comanches so that they can defend themselves against the white conquerors. Maureen O'Hara appears in several of Sherman's films and usually as a powerful woman, an entrepreneur who takes orders from no man, and even a pirate in Against All Flags (1952). In Sherman's last film, Big Jake, she and John Wayne returns to play the leads, as a married couple, and it is a rather moving testament to the career of all three of them. But all of Sherman's films are not bleak, he did for example make two musical comedies with Donald O'Connor in the late 1940s, and they too are good. The first is a very delightful western spoof called Feudin’, Fussin’ and A-Fightin’ (1948) and the other is about a young couple struggling with their 10 months old child. Both husband and wife are at college, he recently back from the war and taking advantage of the G.I. Bill. He also wants to play football, and she wants to take evening classes, but the only way it will be possible is if the man help out as much in the home as the woman. And that he does, and he is fully capable too. So again there is a progressive message here, in showing that a man is just as capable of taking care of a baby and a home as a woman, and that he should do so. It would probably be considered ahead of its time even if it had been made today. Perhaps Sherman's best films are The Last of the Fast Guns (1958), an existential drama in which a man dressed in black travels to Mexico to look for a man who disappeared many years before, and in the end finds redemption in the mountains, and Tomahawk, about a white man seeking revenge on the renegade soldiers who killed his Sioux wife. But they will be discussed at length in later posts. There is every reason to come back to Sherman. There is a scene in the end of the new Godzilla (Gareth Edwards 2014) when the monster is exhausted after a big fight and is lying on the ground, almost covered in dust. Then it sees a human, also lying on the ground, bleeding. They look at each other for a few moments, the monster with a facial expression that combines fatigue, concern and sadness, and then it disappears in the dust. It is an extraordinary scene, and almost completely at odds with the rest of the film. While there is also a very good scene on a railway bridge in the middle of the night, and a magnificent halo jump, the rest of the film is abysmal. It has no coherence or forward-drive, and its scenes are underdeveloped or haphazardous. There is a scene on the Honolulu Rail Transit system in which Ford Brody, the main human character, is involved, as well as a kid that gets left behind when his parents get off the train. Brody tells the parents that he and the kid will get off at the next station and go back. Then there is a cut to a scene in a jungle in which some US soldiers, including the air force, engage in a fierce battle against a monster. After the monster has triumphed it flies away and decides to attack the train and apparently there are hours of journey time between the train stations because Brody and the kid is still on it. This is not a plot hole or whatever people call it these days, it is bad storytelling, or, rather, bad decoupage. Clearly the scene with the jungle battle should have come before the scene in which the kid got left behind with Brody, so that there had been less temporal confusion. As an exercise in Spielbergian images and editing style Godzilla is interesting, the influence is obvious and it is uncanny how they have captured his style. Alas it is not enough. Spielberg cares about his characters: such care is not to be found in Godzilla. The human characters in the film are uniformly bland and uninteresting, and the acting is uninspired. Nobody comes out well in that respect, the monsters and the animals have more life and personality. On this everybody seems to be in agreement, whether you read professional critics, online fans, or people on Twitter. The only difference is whether people think that it matters. Many do not, because it is "a monster movie and all we want is the monster". I do not understand that at all. Most of the film there are no monsters, just the people, and why would any fan find this acceptable? There is absolutely no reason why there could not be interesting characters that we care about in a film such as this, and it would not diminish the role or the impact of the monsters. It is an obvious win-win. Yet, although it would be in their own interest (they would get better films) the fans are not pushing the filmmakers into doing better, but saying that they do not care even though they clearly do. Are they afraid they will be regarded as elitists (in some corners the ultimate insult) if they ask for more? I have no such fear, and so I will ask for more. Had the filmmakers put as much care in the humans as they did on the monsters Godzilla would have been a good film. Now it is considerably less than that. A film that succeeds on both accounts for me is Edge of Tomorrow (Doug Liman 2014), in which the world is attacked by aliens. It is lean, there are no silly jokes, no detours, and it is very exciting and also well-written. I genuinely cared for the characters and the story has a path that was never obvious or dull. The film is set in the present day, with French president François Hollande seen on TV, and it takes place entirely in Europe. That is unusual for this kind of film where the destruction of famous American cities and landmarks has long been a dull cliché, and it is clear that the filmmakers are taking advantage of the fact that this year it is 100 years since the first world war began and 70 years (almost to the day) since Operation Overlord, i.e. the Allied invasion of mainland Europe, took place at the end of the second world war. Both these events are written into the film so that, although it is set now, it is about the past as well as the present. The main male character, William Cage (Tom Cruise), is killed in battle and then reborn on the day he began combat duty (in a sense) so he relives the whole ordeal over and over again. This, in combination with the invocations of the two world wars, can be interpreted as a comment on us humans being in a state of perpetual warfare, and that there is no way out of it. We are doomed to be at war; that is the loop we are trapped in. I liked almost everything about Edge of Tomorrow and I am happy to see Emily Blunt, who I like a lot, playing a tough soldier for a change. Her character Rita Vrataski is, in a way, using Cage in order to save mankind. He is in the beginning a smug PR-man, trying to blackmail his way out of combat. She has the skills, the muscles and the brainpower, what Cage brings to the mission is mainly that he is trapped in this time loop, and she teaches him everything he needs to know. He would be lost without her and eventually the two of them go to battle, side by side. The film reminded me a lot about the first film about Jason Bourne, The Bourne Identity (2002), also directed by Liman, in the sense that they are both serious, gritty and very focused. You could also say that Vrataski is training Cage to become Bourne. (The other two Jason Bourne films, directed by Paul Greengrass, have a different style, but Liman set the tone and it is a bit unfair that nowadays Greengrass gets all the credit.) Liman became an indie sensation after directing Swingers (1996), followed by Go (1999), but his films of late have received less attention. Not unfairly so, Mr and Mrs. Smith (2005) is remarkably lacklustre. But Edge of Tomorrow is not lacklustre, it is really good. One of the great scenes from Swingers, a guy calling a girl he just met and panic ensues. *Tom Gunning is famous for his argument that it is wrong to compare early cinema, in which there was very little storytelling, with what came later. Early cinema was of a different kind, a "cinema of attractions" as Gunning calls it, where the spectacle was what mattered, not characters or story. It is an arguable point but the cinema of attractions did not end around 1903, it continues to our day, in modified form, with Godzilla as an example. 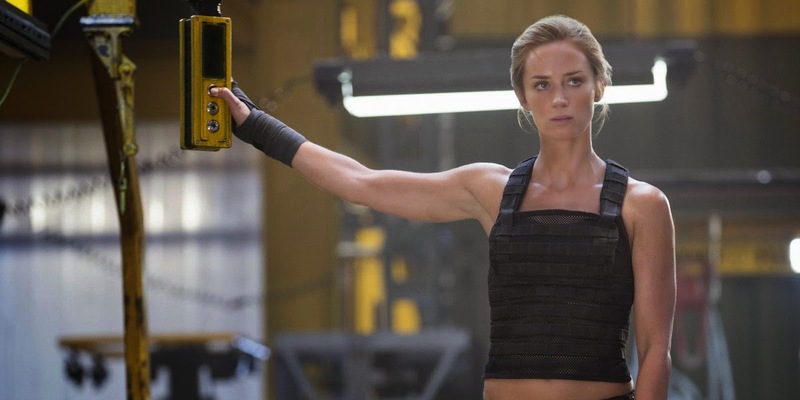 This post is part of an Edge of Tomorrow special among a number of Swedish film bloggers. Here are links to other participants. First one is in English, all the others in Swedish. 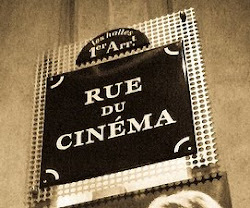 The Velvet Café, Bilder och ord, Jojjenito, Fiffi, Fripps filmrevyer, Haruintesettden 1, Haruintesettden 2, Filmparadiset, Movies Noir, The Nerd Bird. I have decided to add a new feature to the blog, the occasional guest writer, somebody who is given complete freedom to write about whatever he or she wants, and in whatever way they choose, with my job only to proofread it (and perhaps add an image, or a fact or a figure for clarity). Today sees the inauguration of this new feature. Barry Putterman, who lives in New York, is well-known among cinephiles, not least for his regular comments at Dave Kehr's now suspended site Reports from the lost continent of cinephilia. Barry has also written books, such as On Television and Comedy: Essays on Style, Theme, Performer, and Writer (McFarland & Company 1995), and he has written essays about Peter Bogdanovich and George Roy Hill (to be found in American Directors (McGraw-Hill 1983), edited by Jean-Pierre Coursodon). There are few who know as much about American cinema, as well as American society/history, as Barry, and it is a treat to have him as my first guest writer. Public acclaim is an illusion based on popular misconception which distorts ambition and ruins romantic relationships. The first part of that statement is most certainly illustrated by the critical reputation of screenwriter/director Claude Binyon. As reported in Patrick McGilligan’s book “Backstory,” when Leo Rosten polled the Hollywood community regarding the most admired screenwriters in 1938, Binyon ranked in the top ten along with such still highly visible names as Robert Riskin, Ben Hecht and Nunnally Johnson. Today, hardly a cinephile lives that has even the slightest familiarity with the man and his work. And yet his extremely vital and highly entertaining films which explore the entirety of that first statement remain ready for rediscovery and exploration. Claude Binyon was born in Chicago in 1905 and joined the long tradition of that city’s aspiring writers by going to work for one of its newspapers; The Examiner. However, his career as a reporter proved to be short and disastrous due to his most prominently observed personal characteristics; an all but debilitating social shyness and vocal hesitancy. By 1932, his time spent moonlighting on his own fictional writing led to a request to leave the paper and ultimately to the writing staff at Paramount Pictures, where he became the eighteenth writer assigned to work on the omnibus IF I HAD A MILLION. In 1933 Binyon was assigned to work with Frank Butler on the script for COLLEGE HUMOR, starring Bing Crosby and Jack Oakie and directed by the recently arrived from RKO Wesley Ruggles. He struck up what proved to be a lifelong friendship through this professional connection with Oakie, who publicly commented on how much he admired the way that Binyon’s dialogue fit his speech pattern. Ruggles must have been impressed as well, since Binyon was back the following year working with Howard Greene on his film version of the Ben Hecht/Gene Fowler play “The Great Magoo” starring Oakie, retitled SHOOT THE WORKS. And then, it was Ruggles again directing Binyon’s first solo screenplay THE GILDED LILY released in early 1935. This film proved to be a major hit for Paramount, solidifying star Claudette Colbert’s dominance in romantic comedy and catapulting co-star Fred MacMurray from obscure contract player to leading man, as well as to becoming another lifelong friend of Binyon’s. But more to the point, it began an all but unprecedented series of eleven consecutive films teaming Binyon, as solo screenwriter, and director Ruggles. ACCENT ON YOUTH, THE BRIDE COMES HOME, VALIANT IS THE WORD FOR CARRIE, I MET HIM IN PARIS, TRUE CONFESSION, SING YOU SINNERS and INVITATION TO HAPPINESS follow at Paramount. Then, the team moved together to Columbia for TOO MANY HUSBANDS, ARIZONA and YOU BELONG TO ME. 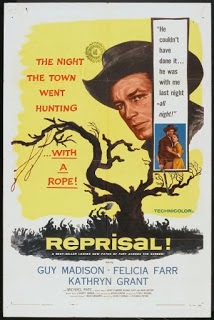 If you discount the studio and/or director dominated projects; adaptions of a Samson Raphaelson play (ACCENT ON YOUTH) and a popular Fanny Hurst styled novel (VALIANT IS THE WORD FOR CARRIE) plus a large scale western (ARIZONA), and add on the two films, gracefully directed by Mitchell Leisen, he wrote after the Ruggles partnership ended back at Paramount (TAKE A LETTER DARLING and NO TIME FOR LOVE), what you have is the core of Binyon’s work. But it all starts with THE GILDED LILY. And Pete has this down to a science, to the point of knowing that the popcorn they are munching is the proper food for the occasion. He demonstrates that he can put his hand in the bag, grab some popcorn and stick it in his craw without taking his eyes off the street. Whereas with peanuts, you have to look down to crack open the shells, remove the nuts and place them in your mouth, thus missing half of the action. “Sure,” Marilyn concurs, “peanut eaters don’t know how to live.” And thus Pete is established as something of a know-it-all philosopher and Marilyn as his affectionately bemused companion. From out of nowhere Pete then asks her; “Do you love me?” and Marilyn thoughtfully concludes “No.” Pete is satisfied; “That’s the way to talk. No jealousies, no commitments….why don’t you love me?” Marilyn responds that her idea of romance is finding a man for whom you feel such commitment that you can ignore all of his flaws and happily sacrifice whatever it takes to live happily with him. Pete tells her that she wants to be Lizzie Glutz; “the girl who runs her own little world to suit herself because she is too unimportant for the world to run her.” But the catch is that the smarter you are, the more you realize that that is the way to live, but Lizzie Glutz becomes Lizzie Glutz only because she’s too dumb to be anything else; which Marilyn isn’t. While Marilyn retorts “you newspapermen know everything,” they both get up to leave; Marilyn to the subway and Pete to his job of interviewing celebrities on the incoming and outgoing ships at the docks, which becomes their first steps on their long journey back to the bench. At the subway, Marilyn is bullied by an aggressive subway guard and a gallant young man with a British accent comes to her defense. Push comes to shove and the two of them flee the ensuing melee to embark on a romantic adventure. The man is charming, but seemingly aimless; as he has no job and no stated ambition beyond courting Marilyn. Aptly, his name is Gray (Ray Milland). They spend a day at Coney Island. And, in a scene somewhat reminiscent of the sound sequence in LONESOME, agree on a mutual desire for few social contacts beyond a comfortable and deeply affectionate marriage. But they once again literally stumble across the family of that self-same subway guide and must once again flee. Marilyn believes that she has found her romantic ideal. But Gray is in reality a British nobleman vacationing incognito in New York who has now trapped himself between his public and private personas. He sincerely wants to marry Marilyn, but his celebrated position obliges him to return to England and both inform his family and break off his engagement lest scandal break out. And so he privately tells Marilyn a lie (that he must depart for a while to investigate a job possibility) which is actually the truth (that he intends to return and marry her). But when Pete arrives to cover his departure at the docks, he must tell the truth (that he is returning to England and his fiancée) which is a lie (omitting his intention to return for Marilyn). Reading this in the newspapers, Marilyn is heartbroken. But Pete plots revenge. He simply turns Gray’s ambiguity around and begins writing stories about The “No” Girl, the plucky American office girl who spurned royal romance and the Cinderella opportunity. So Marilyn is now also two people, the private Lizzie Glutz, and the publicly acclaimed ‘No’ Girl, who in Pete’s words, has become: “one of those peculiar people made strangely famous through ordinary newsprint.” In other words: a celebrity. And, if that was not enough, while Marilyn is drowning her sorrows, Pete promotes her as a café entertainer to cash in on her notoriety. Marilyn is aghast. “One schooner of highballs and I wake up with my name on a billboard. Can’t we pretend we’re sane and call the whole thing off?” But when she is shoved on stage and truthfully confesses that she cannot sing or dance and is even too nervous to remember the lyrics to her opening song, the sophisticated overflow audience accepts this as artful artifice designed to cheerfully welcome them to the inside of celebrity. And when Marilyn’s dancing literally stumbles her into a confrontation with another front page figure, her success is assured. However, being a celebrity turns out to be a full time job. Pete has fathered The ‘No’Girl, but it leaves her no time to be a park bench companion. “Can’t you stick around every once in a while, just to see if I’m getting older or something” he pleads. And the unintended consequences now also affords Marilyn the opportunity to perform in England, where she can at last find out the truth about her romantic ideal. In the final reversal, in reuniting with Gray, she finds that he no longer believes in the lie that was the truth of two nobodies falling in love in New York, but rather now accepts the truth which is a lie of two celebrities who can mutually benefit each other in England. So when Pete sends a wedding present of a box of popcorn with a note asking whether she has found her English park bench, Marilyn uses what celebrity has taught her to stage a very public walkout of her own. And so, with Pete realizing that “no jealousies, no obligations” may not be the way to talk, and Marilyn realizing that romance may go beyond ignoring the other’s flaws; they both fight their ways through separate hysterical mobs to wind up battered and tattered back at their park bench---with popcorn. All of locations of public gathering in THE GILDED LILY, (the subway, Coney Island, the café where Marilyn performs, etc.) turn out to be places of false identity, popular misconception and ultimate humiliation. There is also such a scene near the beginning of THE BRIDE COMES HOME, (a title which relates to absolutely nothing which takes place in the film) at a party celebrating Jack Bristow’s birthday on which he comes into his three million dollar inheritance. However, the film is primarily concerned with examining the three basic Binyon characters established in THE GILDED LILY in further depth. In fact, the film barely contains a story at all; just the three characters continuing whirling around each other towards an inevitable resolution. Jack is the American version of Gray; charming, privileged and completely rootless. He is sweet-natured and genuinely caring, but since he has no concept of work, he has no fixed identity or understanding of how his actions affects other people. Jack is played by Robert Young, who would play the character again in I MET HIM IN PARIS opposite Melvyn Douglas playing a more sophisticated variation on the Fred MacMurray character. And Douglas and MacMurray would play off each other in TOO MANY HUSBANDS. Meanwhile, YOU BELONG TO ME imagines what might happen if the Young character actually married the woman, with Henry Fonda playing the part. 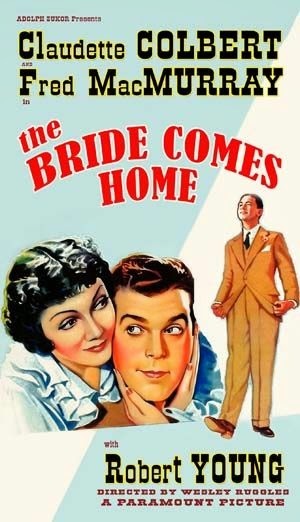 In THE BRIDE COMES HOME, Fred MacMurray continues what would become a career long role as the Binyon male protagonist. Here he is Jack’s hired bodyguard and former newspaperman Cy Anderson. As his split occupation indicates, this character is also two personas, but his duality is internal. He is part mug and part artist, and never completely at peace with either aspect of himself. In INVITATION TO HAPPINESS he is a prizefighter who has a poetic vision of a muse calling to him from across the river. In TAKE A LETTER, DARLING he is a painter who works as a private secretary at an advertising firm. In NO TIME FOR LOVE he is a sandhog who is also an engineer and inventor. Cy’s duality takes the form of publicly resenting Jack’s aimless irresponsibility while privately enjoying his company. While proud of his plebian work ethic, he is constantly conscious of how his lack of refinement inhibits his social acceptance and personal ambitions. And when the now rich Jack asks him what he would want to do if he was not dependent on him for employment, Cy answers that he would like to start a magazine “for men who make their money the hard way.” So it is that “The Man: His Magazine” is born, with Jack as publisher and Cy as editor. Enter the woman. Jeannette Desmereau is Jack’s buddy since childhood and the woman to whom he has proposed marriage about two hundred times. But as Jack has come into his money, Jeannette’s father has gone broke and so she has decided to look for work. And when Jack hands Jeannette over to Cy as assistant editor sans experience, Cy has a new target for the push and pull of his resentments and yearnings multiplied by an enormous sexual attraction. As Fred MacMurray is the male Binyon protagonist, so Claudette Colbert is his female foil and counterpoint. With a naturally aristocratic grace and an ironic appreciation of human foibles, she is balanced between the two males with equal doses of sophistication and character strength. Colbert plays this part in person in these two films as well as in I MET HIM IN PARIS and NO TIME FOR LOVE. And it is her in spirit in INVITATION TO HAPPINESS, TOO MANY HUSBANDS, YOU BELONG TO ME and TAKE A LETTER, DARLING. And, unlike Jack, Jeannette gives as good as she gets. When Cy assigns her the humiliating busywork of counting names in the phone book and tells her to take the desk in the corner with all of the dust on it, her immediate response is: “I could get some more dust if it would make you happy.” But she soon escalates to pummeling him with a barrage of procedural questions about the counting and ultimately forces his retreat. It is left to the woman’s father (William Collier Sr.), a recurring presence in these films (in description in THE GILDED LILY, in person here as well as in INVITATION TO HAPPINESS and TOO MANY HUSBANDS) to convince Cy that this war is his and Jeannette’s form of love as they band together to follow Jeannette’s bread crumb trail in order to invade her elopement to Jack. While THE BRIDE COMES HOME is almost entirely about the characters, TRUE CONFESSION becomes an almost abstract meditation on the chasm between private intentions and public interpretation and the relationship between creative invention and downright lying. Based on a French play “Mon Crime” by Louis Verneuil and Georges Berr, the film is most certainly conscious of another play, by Binyon’s fellow former Chicago newspaper colleague Maurine Watkins, “Roxie Hart.” And, as the Binyon work which comes closest to all out farce rather than behavioral comedy, it could be considered his funniest. Indeed, in many ways TRUE CONFESSION is to Gregory La Cava’s LADY IN A JAM what THE GILDED LILY is to that director’s UNFINISHED BUSINESS. Ken and Helen Bartlett (Fred MacMurray and Carole Lombard) are seemingly complete opposites who have attracted into marriage, but are actually quite similar in their inability to connect public means to private ends. Ken is a lawyer who is so entirely devoted to “the truth” that he refused to defend any client whom he is not already convinced is innocent beyond a shadow of a doubt. Not surprisingly, he is all but unemployable. Helen is a would be writer of fiction who sees no difference between inventing characters in a story for publication and inventing a story about her husband as a character who believes that her typewriter is his recently deceased baby to dissuade the finance man from repossessing it. When Helen takes a job which seems too god to be true as a very private secretary to a stock broker who works at home, it turns out to be just that as she is forced to punch him in the stomach and run out of the house in order to escape his advances. Returning to retrieve her hat, coat and purse, she is swept up by the arriving police who demand to know why she shot the stock broker, who is now lying dead beneath his work room rug. 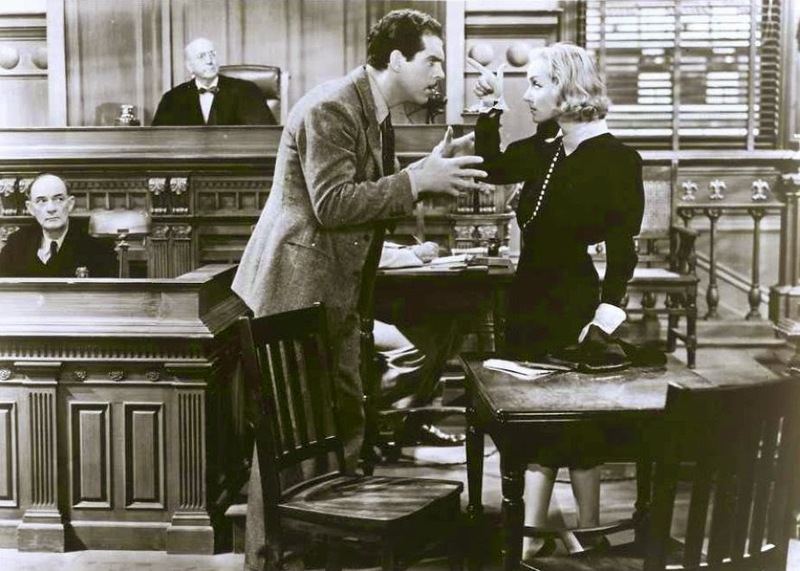 Taken into custody, she is grilled by the investigating detective (Edgar Kennedy) in what she assumes is a story conference. Which, in fact, it is since the police have simply taken the available evidence, drawn the logical conclusion that she is the murderer, and now must only come up with a believable motive to include in a confession. The detective throws open a number of scenarios which Helen finds unsatisfactory until he hits on the “tough dame” character. “You didn’t love him. You don’t love anybody. You’re that kind of a dame” he growls in accusation. Her eyes light up as she exclaims “Gee!”, thrilled at the role she has been given until told that in this version of the story she will either get a life sentence or the death penalty. But Ken’s devotion to the truth is just as logical as the rest of society. All of the evidence points to Helen and Helen has, in the past, been known to make up stories. He is prepared to give her the honest defense of justifiable homicide not only in her own defense, but also in the defense of all woman kind if she will only stop insisting that she didn’t commit the crime. And Helen can see how successfully making this case will also be the making of Ken’s legal career. So rather than “pass that up trying to prove something that can’t be proven,” she relents and confesses. Lombard and MacMurray in True Confession. And just like Marilyn at the café, Ken and Helen win public acclaim. In the wake of the not guilty verdict, Helen is now the author of the newspaper column “My Life, My Struggles” and concocts novels with the same literal tongue-in-cheek concentration gesture that she used to convince the butcher than her husband was dead in order to avoid the meat bill. Ken’s law office is doing turn away business, but his unease about the success being built on his wife’s crime spills over when their new maid (Hattie McDaniel) asks if she shot her philandering husband whether Ken could get her off. “Kind of touchy,” she muses as Ken storms off. When the whole charade finally collapses, Ken manages to repress his joy that his wife isn’t actually a murderess enough to denounce the mockery she has made of truth, justice and the American way. Helen is distraught, pleading “I tried to tell the truth but it seemed everything worked out better if I lied.” In a final desperate attempt to prevent Ken from walking out, she claims to be pregnant. And when that is also exposed as a lie, she responds with what might in fact be Binyon’s ultimate judgment on the subject: “Well, it could be true.” And this inspires Ken to carry Helen back into the house and cure her of lying once and for all. As with many of his contemporaries who collectively defined American romantic comedy in the 1935-1945 decade (McCarey, Capra, Sturges, La Cava, etc. ), Binyon did not adjust as well to the rhythms of post-World War II America. In 1948 he became a writer/director, in many cases adapting books which related to the themes and characters he had previously developed. Frederick Wakefield’s fictionalized version of his dealings with the legendary Broadway producer Jed Harris, THE SAXON CHARM, concerns a playwright who allows the lure of artistic success relentlessly erode his marriage. The conflicting demands of a public career and a private marriage is examined from another angle in MOTHER DIDN’T TELL ME, an adaptation of Mary Bard’s account of life as a doctor’s wife which plays something like INVITATION TO HAPPINESS told from the female perspective. STELLA is a rather eccentric adaptation of a Doris Miles Disney crime mystery novel which reexamines all of the black comedy themes regarding death and the legal system from TRUE CONFESSION and anticipates the movable corpse ploy in Hitchcock’s THE TROUBLE WITH HARRY by five years. And DREAMBOAT, more characteristically taken from an obscure story, is another meditation on public exposure when an upright college literature professor (Clifton Webb of course) is found to be a former Hollywood heartthrob when his old silent movies begin appearing on television. These films, STELLA in particular, are generally satisfying. And, as a director, Binyon is effective without being distinctive. However, given his extreme diffidence, one wonders how he managed to function in this job at all. In Hal Kanter’s autobiography “So Far, So Funny,” he reports Bob Hope saying that during the filming of HERE COME THE GIRLS, by the time that director Binyon managed to stammer out “Cut,” co-star Rosemary Clooney was already back in her dressing room. Most of Binyon’s last decade of screenwriting was taken up with collaborations, the highlights of which were his co-writing with the director on Leo McCarey’s last two films, RALLY ‘ROUND THE FLAG, BOYS! and SATAN NEVER SLEEPS. He retired to his California ranch in 1964. Claude Binyon will never again be listed among Hollywood’s most admired screenwriters. However, a reappraisal and appreciation of his work is long overdue. Unfortunately, many factors continue to stand in that path, not the least of which being the almost complete invisibility of Paramount films beyond the top tier of what are now considered established “classics.” And that situation borders on the criminal given that the rights to these films are controlled by cable giant Comcast which, between the Paramount and Universal libraries, has a ready-made TCM style network at their fingertips, if they could only be bothered to assemble it. The low esteem in which director Wesley Ruggles is held is also an inhibiting situation. Ironically, Ruggles’ modesty, which borders on a complete lack of directorial personality, allows the elements in Binyon’s viewpoint to shine more clearly. He should also be given credit for have a sensitive casting sense, not only for finding and staying with the right actors to inhabit Binyon’s prototype characters, but also assembling a collection of comedy character actors who make multiple appearances throughout the series (including the aforementioned Kennedy, Collier and Hall, but also Tom Dugan, Richard Carle, Donald Meek and others) which develops an almost Sturges like feel to this world. Indeed, if for no other reason, one must thank him for gracing TRUE CONFESSION with the always delightful Una Merkel, who forms a kind of Lucy and Ethel team with Carole Lombard. Still, Ruggles’ pokey, somewhat airless direction, akin to George Stevens without any compensating composition sense, does in fact create a number of aesthetic limitations which must be ignored in order to appreciate Binyon’s work. But then again, if Claude Binyon is philosophically accurate and rediscovery ripped him from Lizzie Glutz’s embrace, the result would only be a hysterical misunderstanding of his intentions and an artificially manufactured version of his artistic persona. A process that I may well have begun right here.